This bamboo Ajiro concept bicycle rethinks both our means of transportation and the ways we manufacture our vehicles. Designed by Monash University student Alexander Vittouris, the Ajiro utilizes a production process that removes emissions instead of releasing them into the Earth’s atmosphere. That’s because the bamboo structure of this vehicle is grown straight out of the ground into a preformed mold. 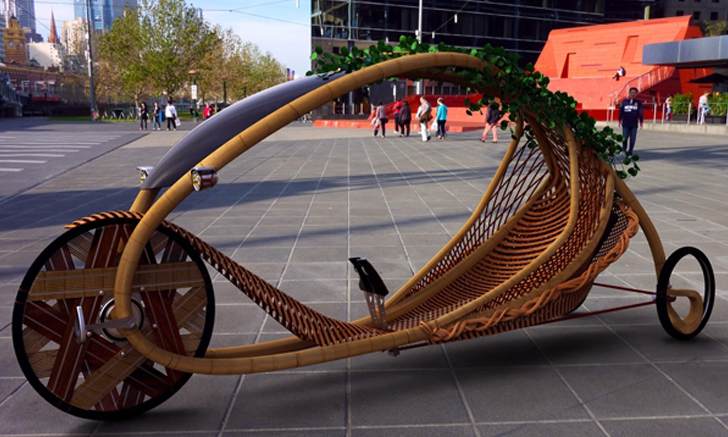 Vittouris envisions fields of bamboo gardens growing these human powered bicycles, which need only small modifications once mature to hit the streets. “Consumption of raw materials has lasting implications – economically, socially and environmentally. This vehicle is about rethinking our approach to both design and ecological sustainability of the products we create and use,” said Vittouris. Instead of depending on the energy of factories to shape material into the form of a car, Vittouris’ design relies on nature for that energy. The Ajiro is not only powered by the driver, but also has an energy storage system that allows for excess power to be stored and used at a later time. The Ajiro also provides a canopy of shelter for the driver and a reclining seat of woven bamboo stalks. After the Ajiro is grown the skeletal structure that was used to form the base can be reused to grow future generations of this human-powered, low energy cycle. Please post a video of someone riding it. Excuse my naivety - first I love the concept and the 'manufacturing' of frame techniques. I am curious about tires and metal handles. How will you mitigate their environmental effects, carbon emissions, metal - non-renewable mining? I'm not asking to be antagonistic - I'm genuinely interesting in the thinking process and the mitigation techniques. Thank you for you innovative thinking. johnmcmullen: Thanks for your comments, and thanks for appreciating the principals of natural production. I understand your concern regarding the timeframe for completion. The rationale however, is to consider that if you use 'straight sections' for fabrication, you still have to obtain/grow all those sections. Sure, by using straight sections you can increase the material sources for instant supply, but the most intriguing aspect to natural shape fabrication is that the shape modification is done all at the same time. The catch with this method is that significant forward planning is needed to establish farms ready for shape deformation - you also need to be absolutely sure that the frame will satisfy all the design criteria. The wonderful thing with bamboo is its relative speed of growth once established. If the "holy grail" of speed would be achievable with species such as Moso - even seasonally, surely 1 meter in 24 hours of growth would classify as 'rapid production'. Its understandable that some culms may not reach full height, there maybe some necessary joining - but the goal is to allow the material to complete as much of the form as possible. Natural failures are just as applicable in farming/produce cultivation as they are with manufacturing defects in conventional mass production...its the job of the design process to limit these where feasible. @Robert Anderson Indeed the Schlumpf hub was fundamental in me recommending the fwd layout, furthermore, the article by Thomas Kretschmer in IHPVA Issue 49 convinced me of the scope for mutli-speed A-I-O hubs for simplified sealed drive. Due to the lack of availability of the Schlumpf hub, at least for the steel prototyping versions, I have used a freewheel 1:1 unicycle hub. Honestly, its performance far exceeded my expectations and I was very surprised by the ease of acceleration, and the reasonable cadence at around 15km/h. Can't expect miracles from a 1:1, but its managed to climb small gradients easily. Fortunately in Melbourne, we don't have many big hills (which is perhaps one of the reasons for the huge amount of fixies in the CBD). Alex, As someone who forms larger tropical bamboo species by a similar method, I applaud your efforts. I too have dreamed of growing curved architectual elements, etc, but I have come with one serious problem i.e., when the shoot is forced by the curving mold to follow its shape there is necessarily friction generated which in turn hinders the free growth and extension of the internodes, that is, the distance between internodes becomes shorter. Thus I was surprised not to see a shortening of the internodes on the tight curve at the front of the bike. Also it appears there were many close half-cuts made in the long smooth curving culm going back to support the roof. This is a common quick method of getting bamboo to curve say in a piece of furniture, but very debilitating. Maybe I'm not interpreting the photo correctly? Alexander: Wow. Beautiful and ingenious. I admire the deep and fresh thinking throughout. Thank you for sharing your bamboo shaping method. Using bamboo to shape bamboo, reducing the need for resource-intense materials, is yet another great idea in this project. Are those spokeless and hubless rear wheels?? Is the frame weight resting directly on the rims? (Mediated by bearings?) If so, that is also wonderfully clever. @kadajawi: I have trialled the prototype as a steel frame (I needed to prove the structure quickly), and it is stable while cornering. Most of the rider weight is over the rear, which helps make it stable as does significant camber on the rear wheels. Max speed is around 20km/h with the 1:1 drive freewheel hub, but there are geared unicycle hubs available. The only time where problems may arise is when powering up a gravel or wet hill, it can induce some wheelspin depending on the type of tyre used. The rear wheel steering works well, although it takes some getting used to the reverse action. However, it doesn't take long to master, and can u-turn on a two lane road. The decision for using rear wheel steering was to use the natural hollow bamboo as the wheel attachment and pivot point (press fit appropriate matched bearings to the bamboo size), removing the complexity of a separate kingpin found in front steering velomobiles. Its still in prototype development, but all you need is to bend a suitable pipe to the shape desired, cut it in half, and attach it to the bamboo culm. The culm will grow through the pipe at the desired shape. You can either use a metal pipe or PVC to start the process, but after one plant is shape grown, the bamboo can be cut down the centre, and use the bamboo itself to grow more 'new' bamboo through. Therefore you get a nice closed loop production process with few ongoing materials. Alexander, would you be willing to share the design of the assembly you used to shape the bamboo growth? Very cool stuff, great job. Good luck! Is it safe? Can it go around corners? I can totally see an XXL version of this as a rickshaw. Hi its Alexander Vittouris here, designer of the Ajiro velomobile. Thanks very much for your feature and write up of my vehicle design. Obviously such a concept requires significant evaluation and prototyping before a concept can be described as being complete. Furthermore, approaching production as a "farming/agricultural" method requires significant establishment for the plants themselves (just like you wouldn't expect to harvest a fruit tree within a year of planting). Since the project is still in early stages, currently I am trying to establish avenues for funding (farming land, plants etc do not come cheaply). Since this project is part of academic research into alternative production methods and product sustainability, further in depth study is needed to establish credibility and expertise. I would say the time frame for the research study, acquisitions of land and bamboo plant establishment will take a number of years, and hopefully fully resolved outcome by the end of doctoral research. I am absolutely determined to have validated the shape modified process - tubular shape modification of bamboo works well, and I consider it to make a valuable contribution to product design and construction. Ajira bike, great cocept and great look. I want one. Wherere and when are they available and how much? This bamboo Ajiro concept bicycle rethinks both our means of transportation and the ways we manufacture our vehicles. Designed by Monash University student Alexander Vittouris, the Ajiro utilizes a production process that removes emissions instead of releasing them into the Earth's atmosphere. That's because the bamboo structure of this vehicle is grown straight out of the ground into a preformed mold. 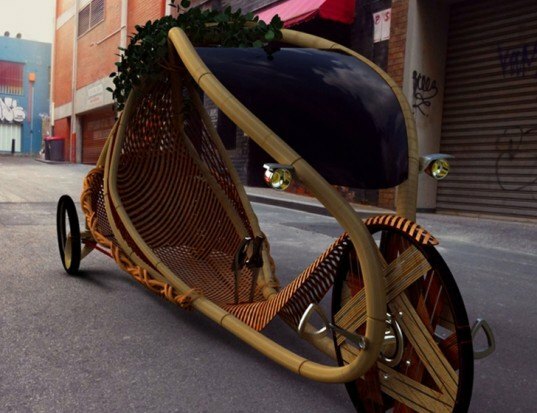 Vittouris envisions fields of bamboo gardens growing these human powered bicycles, which need only small modifications once mature to hit the streets.